To feed themselves and their families, and to benefit from increasing demand for livestock products in developing countries, livestock keepers must have access to good quality feed for their livestock. Feed availability is currently a major constraint to increasing livestock productivity in many countries. Overcoming this constraint is an elusive goal. People implementing technical feed interventions often adopt a ‘trial and error’ approach that fails to properly diagnose both the nature of specific feed problems and the opportunities and the means to deal with them. So far, most efforts to increase feed supply have tended to focus on finding technical solutions. We believe that paying more attention to – and better understanding – the broader context in which feed sits is a promising way to complement and extend the impacts of these efforts. The Feed Assessment Tool (FEAST) is a systematic method to assess local feed resource availability and use. It helps in the design of intervention strategies that will optimize feed utilization and animal production. FEAST differs from conventional feed assessment approaches that focus on the feeds, their nutritive value, and ways to improve it. FEAST broadens this assessment to account for the importance of livestock in local livelihoods, the relative importance of feed problems locally, and the local situation related to labour, input availability, credit, seasonality, and markets. ILRI has been developing this tool over the past three years. It has been tested and tried in various sites across Africa and South Asia. FEAST has been used in the East Africa Dairy Development project (EADD) as an entry point for further interventions. FEAST offers a systematic and rapid methodology to assess feed resources at site level with a view to developing a site-specific strategy to improve feed supply and utilization through technical or organizational interventions. The tool is aimed at research and development practitioners who work in the livestock sector and need a more systematic means to assess current feed-related strategies and to develop new ones. FEAST is a participatory action research tool to help facilitate structured conversations with farmers and other relevant stakeholders. It is used to focus solutions and to develop an action plan. 1. A focused PRA exercise that provides an overview of the local farming system, with particular emphasis on livestock feed aspects. 2. A simple and brief quantitative questionnaire, designed to be completed with farmers by a FEAST facilitator. 3. A process of data analysis to help develop interventions. FEAST usually results in a short structured report with supporting data on overall feed availability, quality and seasonality. The tool also gives some indication of the key livestock-related problems as seen by farmers. This can be used to inform intervention strategies. 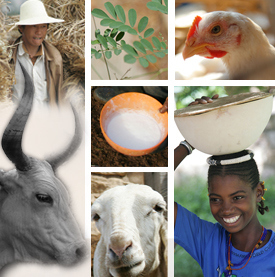 The FEAST tool was originally developed by the International Livestock Research Institute (ILRI) and the International Center for Tropical Agriculture (CIAT). Many individuals and institutions around the world have contributed to its development and testing. Its ongoing development is currently supported by the CGIAR research programs on Livestock and Fish and Humidtropics. This is such a powerful tool, and I like the eLearning course. Thanks Kelvin – glad you like it.